I just love mystery ingredients! I think I would do well in a mystery box challenge (which gives me an idea…) but, back to the challenge Cindy gave me. She gifted me these three mystery ingredients and so I made Cindy’s Crayfish Curry. 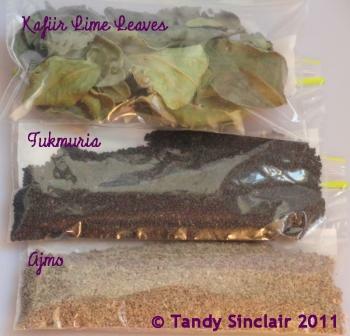 The kaffir lime leaves were used with hake and the next challenge was to make use of the ajmo. I had never heard of these before, and google was not being very helpful and so I turned to my curry book and looked at every single picture until I came across what ajmo really is. They are carom seeds. These are closely related to cumin, which it resembles in appearance and fragrance. Carom seeds (ajowan) have a hot and bitter taste. However, when they are cooked with other ingredients, the flavour mellows. Carom seeds are particularly good in seafood dishes and with root vegetables. I decided a nice crayfish curry would be in order to make good use of these ingredients. Well done Inspector Tandy for tracking down what the ingredient was and then making such a delicious dish! Sounds perfect for dinner! Love kaffir lime leaves in…oh, just about everything. 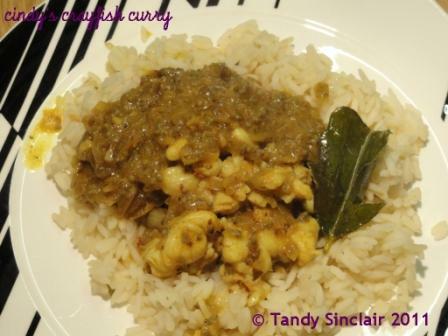 I have never made (or even think of) making a crayfish curry – this sounds yum! What a fun idea between you and Cindy! I love the look of your dish. What a fun idea…I love mysteries as well. 🙂 You whipped up a great dish. Looks yummy! Oh I’ve never had crayfish this way! Looks wonderful. Wow, I’ve never heard of ajmo before! The recipes looks and sounds amazing. What a great way to use crawfish (that’s how we say it in Texas 🙂 ) I would love to try this soon! please do, and let me know how the crawfish work out! Wonderful flavours Tandy – it must smelt great as well as tasted incredible. I DEMAND this next time I come over for a slumber party with Molly and Patch!